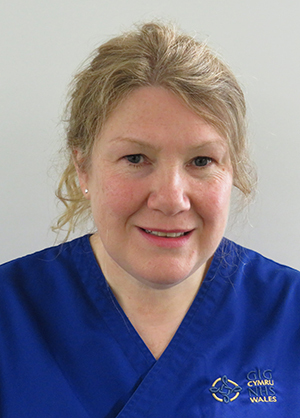 Why did you become a colorectal clinical nurse specialist? To make a positive difference to the experience of patients with colorectal disease and stomas and provide support ensuring that the patient is always central to care – from diagnosis to follow up. Become a journalist as I enjoy writing and am also quite inquisitive. I have been in my role for nearly 22 years, but I’ve worked in a variety of clinical settings. I spent time working on a surgical ward, worked as a community nurse and then as for a period as a research nurse at the Public Health Laboratory services in London. I also spent some time working as a nurse on a film set – which sounds glamorous, but was actually hard work. Most of my career has been spent in Wales. As a fluent Welsh speaker I am able to deliver care to Welsh speakers in their first language. This is important as some people can only express their needs effectively by speaking their first language. Making a difference to people’s lives on a daily basis. No two days are the same. I enjoy my work and pride myself on delivering high-quality evidence-based care to patients with colorectal disease and stomas to support them with managing their life-changing surgery and change in body image. It gives me great satisfaction to share practice and to transfer my personal values through leadership skills. You were recognised for your initiative working with GPs at the 2017 RCN Wales Awards. What did this involve? The aim of the work was to identify the cost benefits associated with a review in a GP surgery and rationalisation of patient prescriptions. Because of the extensive list of stoma appliances and accessories available on drug tariff and new products being updated continually, it can be difficult for general practitioners to stay up to date about what to prescribe for stoma patients. Many patients order products and accessories inappropriately, which results in wastage from stockpiling and inappropriate and unnecessary use of products and accessories. Ensuring timely and expert follow up of stoma patients was an important quality driver. The work shows real evidence of cost effectiveness. The benefits and effects on service reflect the value that clinical nurse specialists add to patient care. Reviewing stoma patients can potentially prevent them having to see a GP resulting in cost savings of GP appointments. Giving specialised timely advice can also help prevent unnecessary hospital admissions and consultant appointments. By reviewing patients hidden or undiagnosed stoma complications can be identified and treated. Patients and the way they adapt and cope with life-changing diagnosis and surgery. I enjoy helping on the family farm. Lambing season is my favourite time of year and I love my annual lambing holiday. I am a keen hill walker and set myself a challenge every year. I am training for my second Three Peaks Challenge, an event where participants attempt to climb the three highest mountains in England, Wales and Scotland, to raise money for the Welsh Air Ambulance. I enjoy reading and regularly review Welsh books for a magazine programme and I will happily spend hours doing my crochet or felting. Qualifying as a registered general nurse in 1986 – it is where it all began. A close second was gaining a first class honours degree in Welsh literature after studying part-time for more than six years. What advice would you give newly qualified nurses? Find a good work-life balance. Do not be afraid to ask questions. Have confidence in your own judgement. Never lose your sense of passion for delivering care – and invest in a pair of comfortable shoes.